Prepare crab stock and use it to make crab sauce. Heat 2 cups crab sauce over medium heat. In large pot, combine 1 cup warm sauce with pasta and 2 tablespoons butter and toss to heat through. Add remaining 1 cup of sauce, 12 ounces fresh crabmeat, crab claws, the remaining 2 tablespoons butter, the basil and parsley. Stir gently until mixture is heated through. Sprinkle with sherry and stir gently. Heat remaining 8 ounces fresh crabmeat in a little butter in pan or in microwave. To serve: Divide pasta mixture among 4 large serving plates. 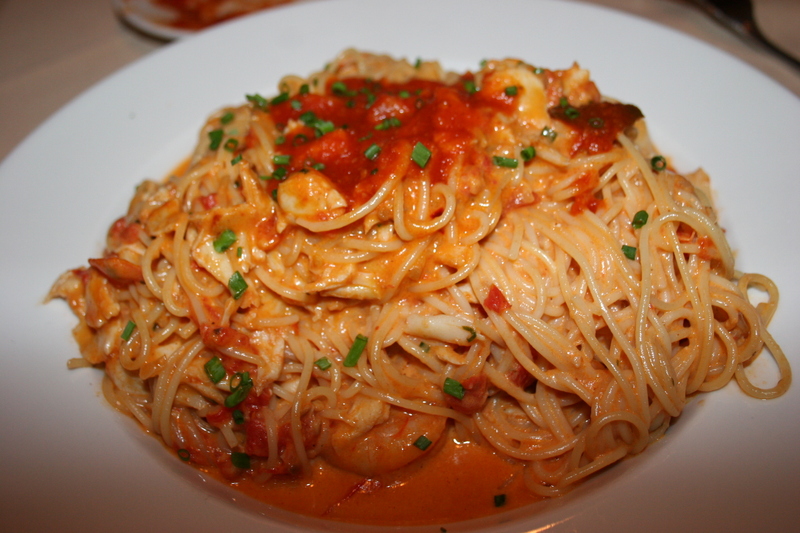 Evenly distribute crab meat over pasta. In large soup pot, heat oil. Add vegetables and cook over low heat until caramelized and evenly colored, about 15 minutes. Add crab pieces, breaking them up to extract their flavor, and cook 10 to 15 minutes, stirring regularly. Add peppercorns, red pepper flakes and bay leaf and cook 1 to 2 minutes. Add flour and cook 1 to 2 minutes, stirring regularly. Deglaze with wine and cook about 2 minutes, stirring regularly. Add tomato paste and canned tomatoes. Add water, salt and pepper and base. Remove crab and set aside; save for another use, if desired. Lightly puree stock with stick blender 2 to 3 minutes. If you do not have a stick blender, transfer to blender and puree. Strain through fine metal sieve and discard solids. Let liquid cool to 45 degrees. Makes slightly more than 1 quart. Use 2 cups of stock to make crab sauce. Freeze remaining stock for future use. Combine all ingredients and mix well. Let chill. Remove 2 cups sauce to use to make pasta dish. Refrigerate remaining crab sauce to use over other pasta / seafood dishes.